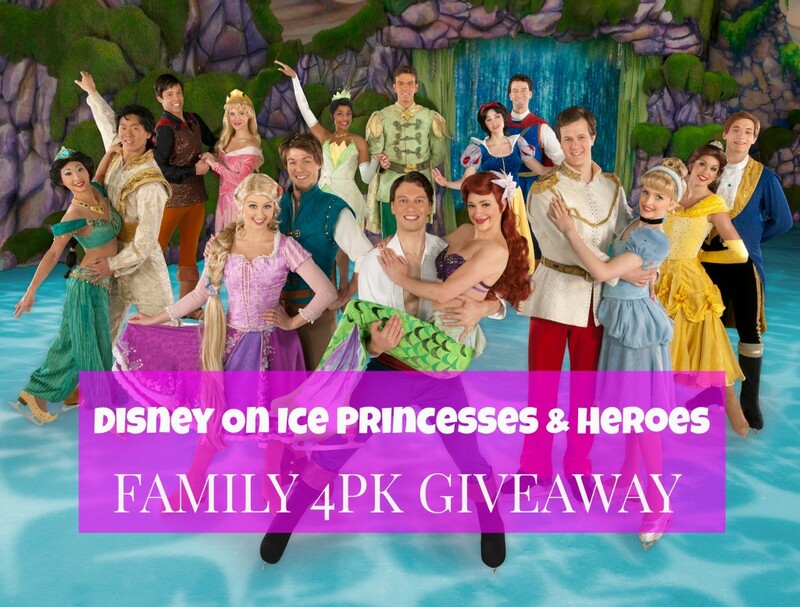 Disney On Ice Presents Princesses & Heroes family 4pack GIVEAWAY! You are here: Home › events › Disney On Ice Presents Princesses & Heroes family 4pack GIVEAWAY! Calling all tri-state Disney fans, Disney On Ice presents Princesses & Heroes Presented by Stonyfield YoKids Organic Yogurt is coming to 2 locations in New Jersey in January 2015. Disney Princesses Ariel, Belle, Cinderella, Rapunzel, Tiana, Jasmine, Aurora and Snow White will share their classsic stories through artistic skating and acrobatics. If you have not experienced seeing a Disney on Ice show yet, it is a must for all Disney fans young and old. There is something even more magical about seeing the storytelling on ice and we will be giving away a family 4pack to see the Izod Center show on January 2, 2015. Details to enter for the giveaway are below on Rafflecopter or you can click here to enter as well! Performing at IZOD Center from Jan 1 through Jan 4 and at Prudential Center from Jan 15 through Jan 19. Audiences will be transported to a world where imaginations soar and anything can happen if they just believe. The Disney Princesses embark on the adventure of a lifetime thanks to the help of Tinker Bell’s magical pixie. Royal sisters, Anna and Elsa along with Olaf and rugged mountain-man Kristoff travel through a fantastical winter wonderland to discover true love conquers all. Then entering a world of wonder where heroes and hearts prevail, guests get to see other favorite Disney Princesses such as Jasmine who discovers a whole new world with Aladdin after meeting her unlikely hero in the marketplace. Prince Philip defeats the evil fire-breathing dragon Maleficent in a race to save his true love Aurora. Prince Eric breaks Ursula’s spell so that Ariel can remain part of his world. Rapunzel, Tiana, Cinderella, Belle and Snow White also find happiness in this beautifully imagined ice show. Produced by Feld Entertainment, Disney On Ice presents Princesses & Heroes features an incredible display of special effects, stunning set design and breathtaking choreography on the ice. Thursday, Jan 1, 2014 at 1:00 P.M.
Friday, Jan 2, 2014 at 11:00 A.M. and 3:00 P.M.
Saturday, Jan 3, 2014 at 11:00 A.M., 3:00 P.M. and 7:00 P.M.
Sunday, Jan 4, 2014 at 11:00 A.M. and 3:00 P.M.
Thursday, Jan 15, 2014 at 7:00 P.M.
Friday, Jan 16, 2014 at 7:00 P.M.
Saturday, Jan 17, 2014 at 1:00 P.M. and 5:00 P.M.
Sunday, Jan 18, 2014 at 1:00 P.M. and 5:00 P.M.
Monday, Jan 19, 2014 at 1:00 P.M.
For tickets go to Ticketmaster or call (800) 745-3000. If the Rafflecopter widget does not appear below for the giveaway you can click here to enter as well! 3 Responses to "Disney On Ice Presents Princesses & Heroes family 4pack GIVEAWAY!" My Favorite Princess will always be Ariel!